Unique custom wall murals. Design it Yourself. APPLY it Yourself. Your custom wall mural will be printed on a beautiful luxurious woven sticky textile. Ready of application. No tools required. Just use your hands. Your own bespoke custom mural will perfectly fit with your business needs (office, shop, restaurant, etc.) or personal needs (home, bedroom, living-room, nursery, etc.). Add your own name, logo, patterns, design, texts, lettering, house number, family crests, etc. to your bespoke wall mural design. Design it yourself. 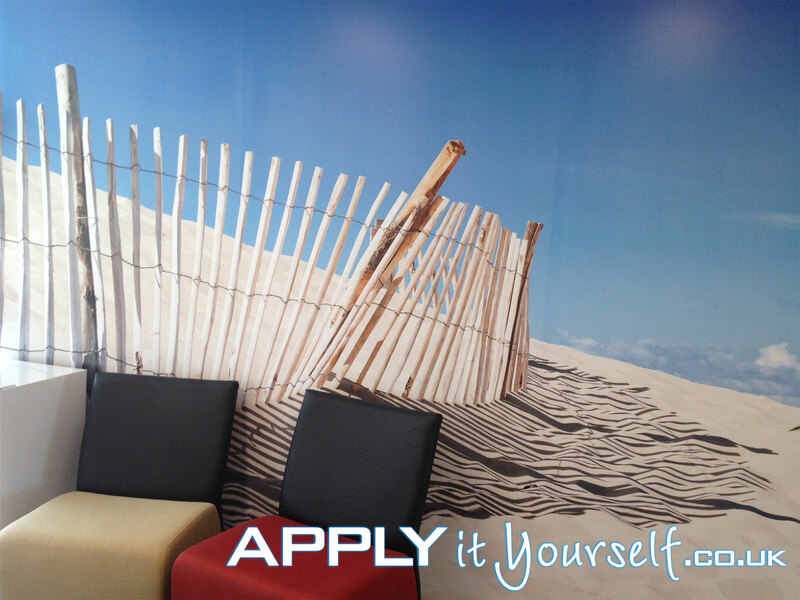 Design your custom wall murals to perfectly fit with your house, business, architecture, brand or corporate image. Design it yourself, quick and easy with our online designer. Or just email us your own custom wall mural design, for a cut-to-shape (i.e., non-rectangular) custom design or if you require multiple/large wall murals. Our made to measure wall mural solutions are made of a high quality woven sticky textile. Providing you with years of enjoyment. Apply it yourself. Your wall unique wall mural will arrive pre-assembled. Ready for application. No tools required. 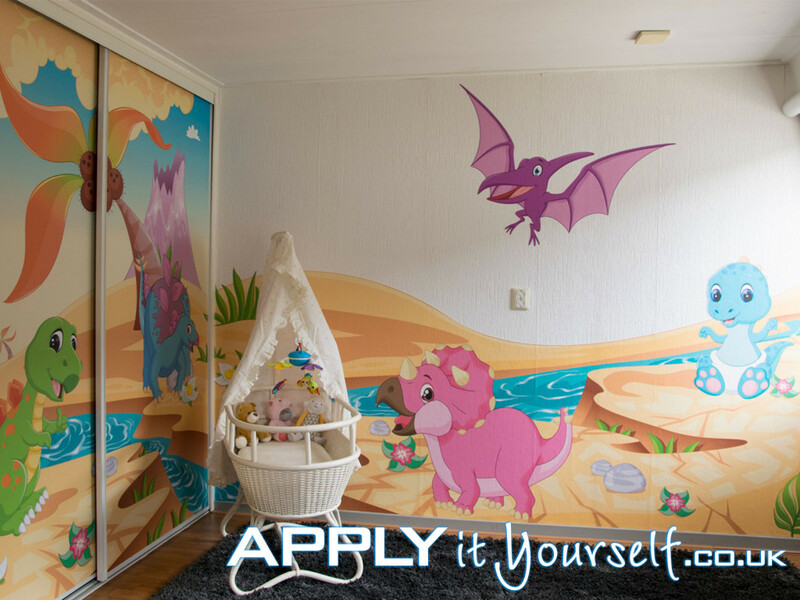 Thus, your wall mural is very easy to install. In addition, due to the high quality woven textile and bubble free characteristics of our film, it will be extremely easy to apply yourself without bubbles. Our bespoke wall murals can be applied to both indoor and outdoor walls/surfaces. Below you will find our online designer, which you can use to design your own unique rectangular custom wall mural solution. We advise you to use a PC/MAC or a tablet in landscape mode when using our online design software. Enter the required dimensions in mm. We advise you to read the instructions below the online designer. And subsequently watch our instruction video below the instructions. On how to design your own unique bespoke wall murals. Price below is excl. discount & VAT. Here you can upload your own designs/images as a .jpg, .jpeg, .png or .gif file (.eps/.ai/.pdf/.psd also possible). 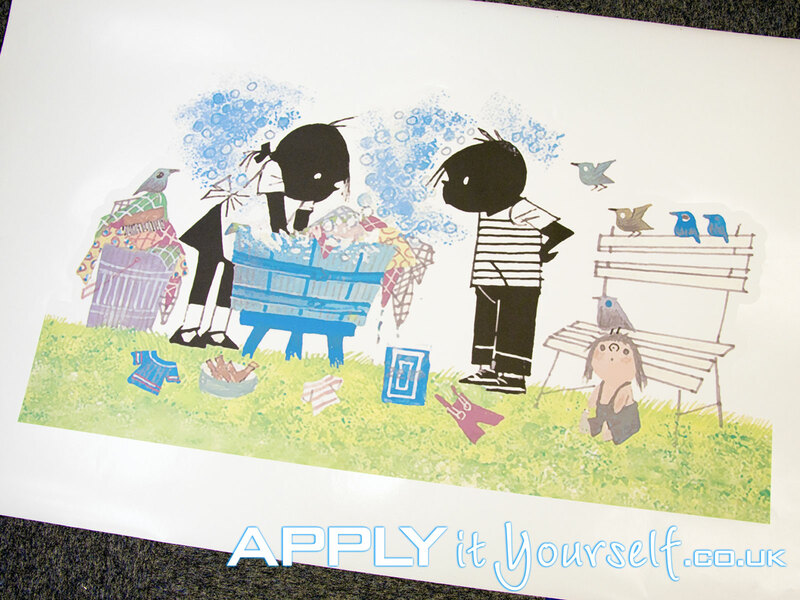 If your file does not properly upload or you require your wall mural to be cut to a non-rectangular shape. Contact us directly by email and attach your files, together with your wishes and wall film type and required dimensions. For the entire design specifications? See here. Simply use our online design software to design your own unique bespoke wall mural. Or use your own software (Adobe Illustrator, Coral DRAW or opensource Inkscape.) and upload your design in our online designer. To see all the design instructions toggle the box below open, by clicking on the plus sign. 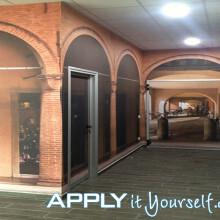 Design your own unique rectangular custom wall murals, to perfectly fit with your personal and/or business needs. Upload your own design and/or use one of ours. Everything is possible in our online designer. 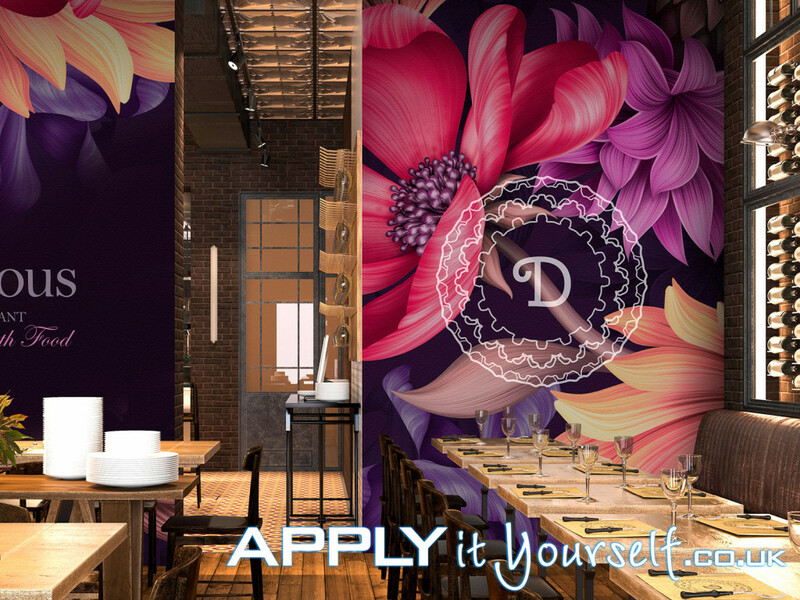 Designing your own rectangular custom wall murals. Enter the size of your rectangular wall mural in millimetres into the online designer, say 500 x 500 mm. Maximum size 1330 x 3500 mm or 3500 x 1330 mm. 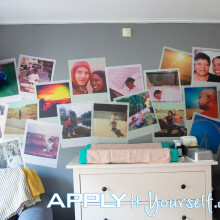 If you are looking for larger wall stickers. Please contact us by email. Select the material you want. Your bespoke wall mural can be printed on (A1) a woven sticky textile with a normal adhesive or (A2) with a easy removable (repositionable) self-adhesive (for temporary wall murals up to about 3 years removable/repositionable). A2 type of murals are only suitable for smooth surfaces. Do you already have a design? You can upload yours using the “Add Design” on the left side of the online designer. For cut-to-shape designs, contact us directly by email with your wishes, dimensions and designs. If you require non-western texts (Arabic, Japanese, Mandarin, Sanskrit, etc.) please contact us by email with your design. Make sure you are using a recent version of a modern browser like (Chrome, Safari, FireFox or Edge) without add-ons/extentions/plug-ins, like ad-block, no-script or ghostery or proxies that block certain domains. Wall murals cannot be cut into complex designs. The shape of your wall mural needs to be very basic, like a circle, snowman, dog-paw, etc.. There are 3 options for your custom wall murals. A rectangular design, which you can design using the online designer. A cut-to-shape design with a (white) border around the design. 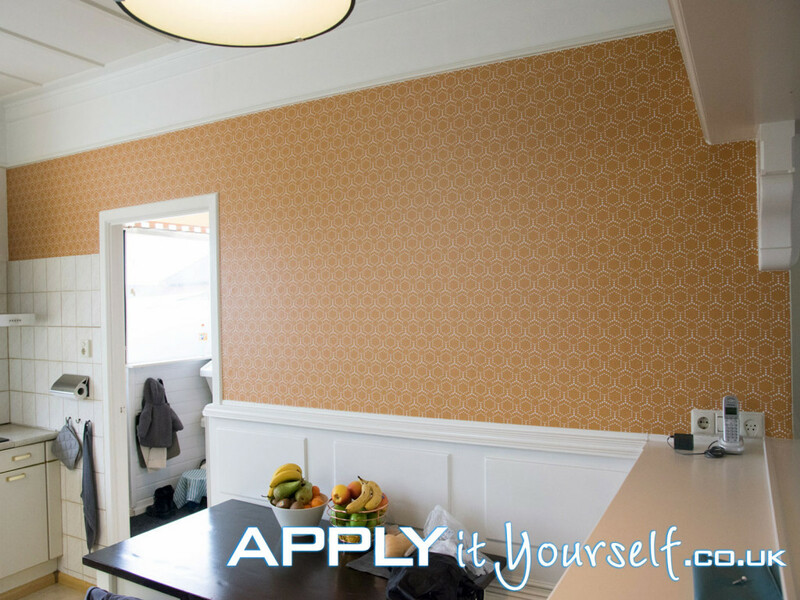 A cut-to-shape design without anything around your wall sticker design. For the last 2 options (2 and 3) contact us directly by email with your wall mural designs, wishes and dimensions. Below you will find an instruction video on how to use our online designer in order to design your own custom wall murals. Enter your texts. Re-position it at the required location. Change text alignment. Change font size and/or change font. 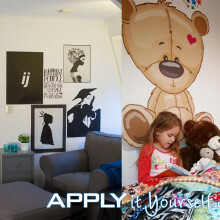 You can add additional texts to your wall sticker with the “add textarea” button. Flip texts and objects both horizontal and vertical. Add and rotate objects and/or texts on your bespoke wall sticker. With the “add design” button you can upload your own image, design, logo, etc. With the “copy button” you can copy objects and texts to make your wall mural fit with your need. When one layer is in front of the other, you can move them forward and backward. When you are finished with your custom wall mural design, add it to your cart. 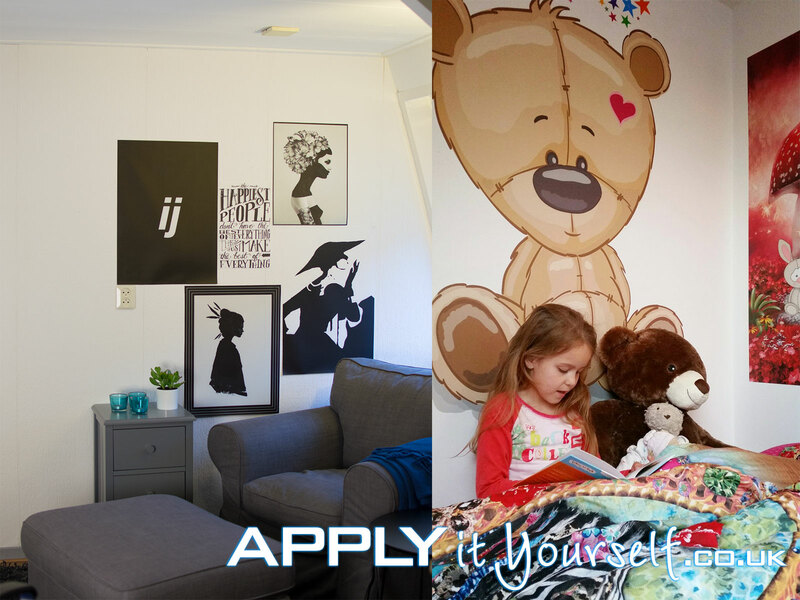 Select “OK” to go to the payment page or “cancel” to design another custom wall mural design. Select your country and calculate the shipping costs. Enter your email address and your billing and shipping details. Select your payment method of choice and pay. Shipment will occur in 3-5 working days. Your unique bespoke wall mural will be of a professional high quality woven textile. For long durability. Highly weather, water and UV resistant. We do advise you to only use wall murals for temporary outdoor use not for long-term outdoor use. As the material tends to collect dirt outside and is not as easy to clean as wall stickers. To see more material information toggle the box below open by clicking on the plus sign. The sticky textile (wall mural) has multiple advantages over wall paper. The wall mural can be easily and quickly applied to the wall with only your hands. No tools are required. Is water resistant, and can be lightly cleaned with water. Thus, also suitable for outdoor use. The A2 type of self-adhesive sticky textile is also repositionable/removable. 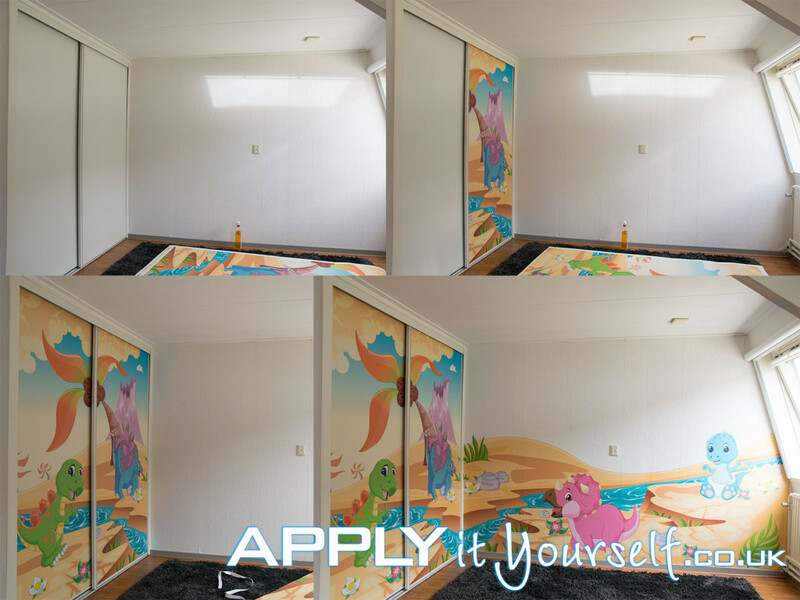 So every couple of years you can easily change the look-and-feel of a room, within minutes, by quickly removing the old wall murals and applying the new wall murals. Very handy for the children’s bedrooms while they are growing up, as it allows for a quick and easy change to the look and feel of a room. Repositionable wall murals are also handy at the office, as people can take them with them to their new location/office. 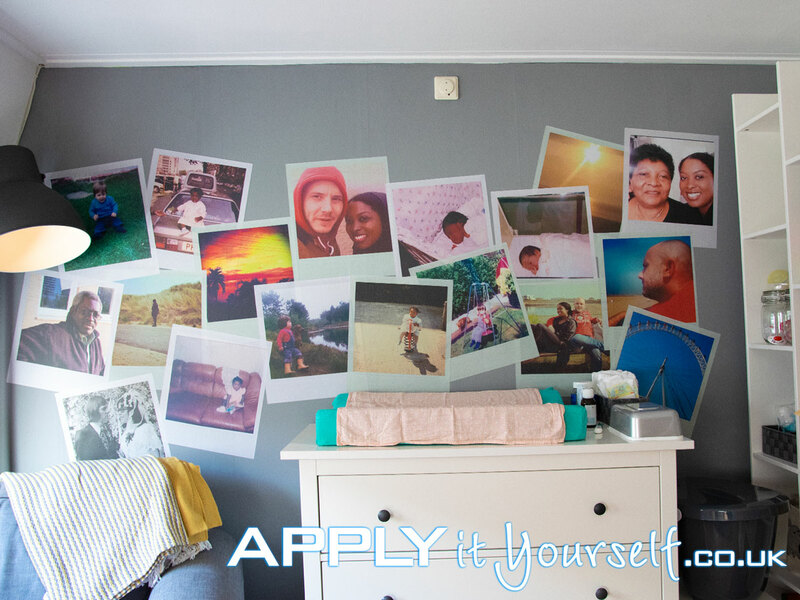 Or just change the layout of your wall murals every couple of months. Your unique bespoke wall mural will be of a professional high quality woven textile. For long durability. Highly weather, water and UV resistant. Providing you with years of enjoyment. We do advise you to only use wall murals for temporary outdoor use not for long-term outdoor use. 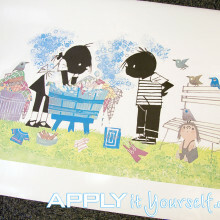 As the material tends to collect dirt outside and is not as easy to clean as wall stickers. The A2 type of self-adhesive sticky textile is also repositionable. Thus, your bespoke wall mural can be printed on (A1) a woven sticky textile with a normal self-adhesive or (A2) with a easy removable (repositionable) adhesive (for temporary wall murals up to about 3 years removable/repositionable). A2 type of murals are only suitable for smooth surfaces. Wall murals (sticky textile) have a mat woven textile appearance and can be cut into basic shapes. The sticky textile is not 100% opaque so a similar light colour surface/wall is advisable (especially for light coloured designs). Our murals (sticky textiles) can also be used on windows, walls or tiles as branding, advertising, or decoration. Wall murals can also serve as a tool to inform and warn people. Make sure to thoroughly clean your walls, remove dust, grease and other dirt. This is extremely important. Only apply your custom wall murals on normal, flat, solid and smooth surfaces. Like metal (Aluminium, DiBond/ACP, (stainless) steel) non-oil releasing plastics (Acrylic, PVC/Forex, Trespa/HPL) and wood (laminated wood/hardboard). When applying in a wet/outdoor environment the surface needs to be solid (i.e., does not absorb water/liquids). Do not apply our wall mural solutions on walls which contain water/dirt repelling paints (i.e., paints containing teflon/silicone like substances). Do not apply your wall mural on freshly painted walls, wait a couple of weeks for the water and other chemicals to thoroughly evaporate/dry out. You can add the following elements (birds, borders, circles, custom Designs, decorative figures, door numbers, flowers, family crest, house number, logo, lettering, numbers, patterns, stars, signs and/or texts) to your custom wall mural. Your bespoke sticky textile wall mural will arrive in a sturdy box. Ready for application. No tools required. 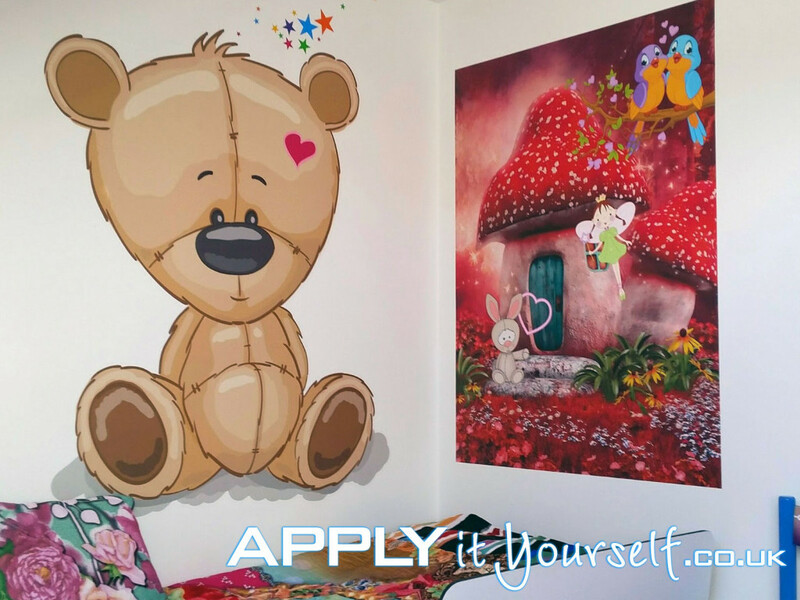 To see more information about how to apply your wall mural, toggle the box below open by clicking on the plus sign. How to apply wall murals. Always, first read, our extensive general information here, before your start the application/installation of your custom wall mural (sticky textile). 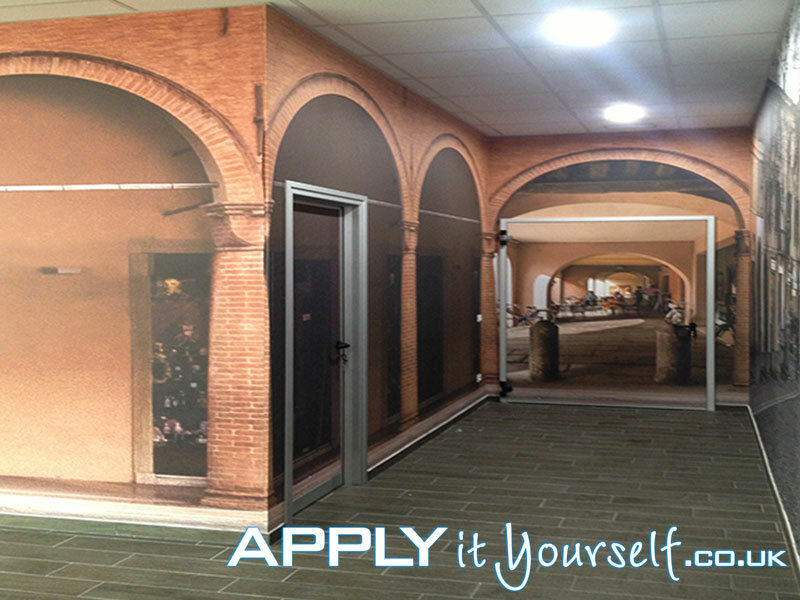 Go here for the most up-to-date application instruction for your wall mural. 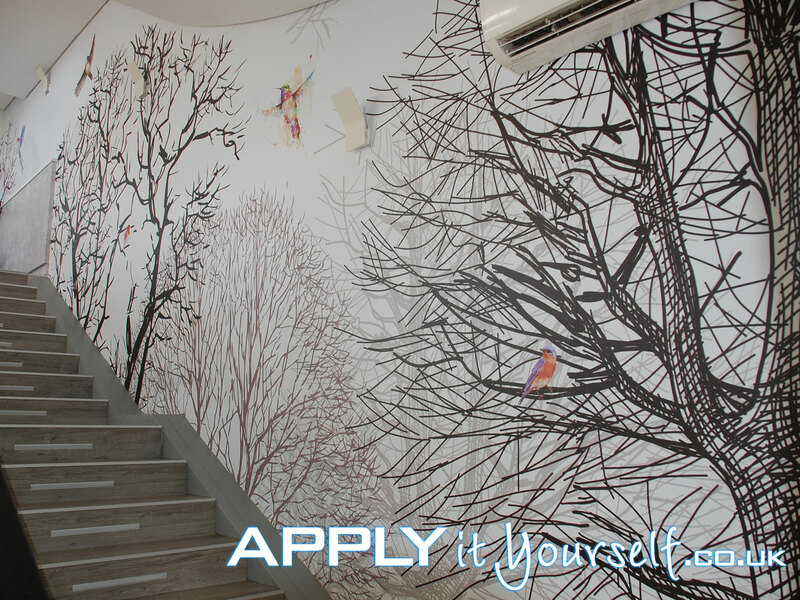 Below you find application instructions on how to apply your own bespoke Wall Murals (Sticky textiles (A)). Always keep your custom wall murals (sticky textiles) flat so they do not bend/fold. Make sure to not apply your sticky textiles in direct sunlight, make sure the temperature of the mural, the wall/mounting-surface itself and the surrounding air, is -ideally- around 12 to 18 degrees Celsius. When the temperature is above 18 degrees we advise you to wait. Extensively clean the wall/mounting-surface. Remove paint, grease and other dirt. If any is left behind, it will always be visible! Also be sure that the paint has sufficiently dried (wait at least 2 to 3 weeks before installing large wall murals onto freshly painted walls). All water and solvents must have evaporated before installation. Also clean the surrounding area. 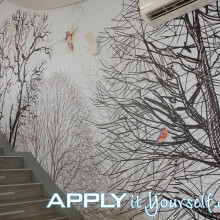 If you are applying you wall mural near the ceiling and/or the ground make sure they are also clean. Also be wear of flying insects and roaming pets. REMOVE all jewellery from your hands and make sure your hands are clean. As to not damage the mural during application. Carefully, remove the backing paper away from the mural. When your bespoke wall mural contains cut-outs/letters/elements, be very careful when removing the backing paper, as to not tear the film itself, when parts of the wall mural remain stuck to the backing paper. Take your time, most mistakes occur here! 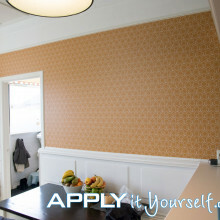 Position the bespoke sticky textile at the preferred location and apply your wall mural to the wall/mounting-surface. You may want to use 2 or more people for this. 1 using using his or her hands and 1 or 2 holding the ends of the bespoke wall mural. Start in the middle/centre of the wall mural and move horizontal with overlapping movements towards the edge of the mural. During which you hold the wall mural a couple centimetres (2 inches) above the wall/mounting-surface itself. If the surface is not a solid smooth surface (like glass, HPL, ACP, PVC, Metals like aluminium and steel, etc.) you can directly position your sticky textile to the wall/mounting-surface itself. As a non-solid non-smooth surface will make it very easy for the air to escape. After application. Check to see if there is still any air trapped between the sticky textile and the wall/mounting-surface itself. In the rare occasion that air is still trapped between the wall/mounting-surface and your bespoke mural. Gently push on the air bubble with your hand and/or finger. 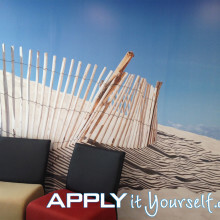 Custom and unique wall murals for the offices or personalised wall murals for the living room wall with family crest, design, name and/or quote. Anything is possible. Your bespoke bubble-free wall murals, from APPLY it Yourself, will provide you with numerous advantages. A Unique Design, made-to-measure and cut-to-shape. A website and online designer full of useful ideas and designs. Do it Yourself (DIY) design & application with easy to follow online instructions and instruction videos. The wall mural allows for easy bubble free application with unlimited decorative possibilities. Your custom wall mural will arrive, ready for installation. No tools required. Below you will see a large number of different possibilities. Rectangular designs. Cut-to-shape designs with and without a white border around the design/logo. Examples of custom and bespoke wall murals, with logos and texts. Bespoke wall mural solutions cut-to-size and/or cut-to-shape. You will find more examples of bespoke/informative wall murals here.